Services are scheduled for 9:30 a.m. Friday, Feb. 19, at Our Lady of Grace Catholic Church for Lupe L. Hernandez of Artesia. 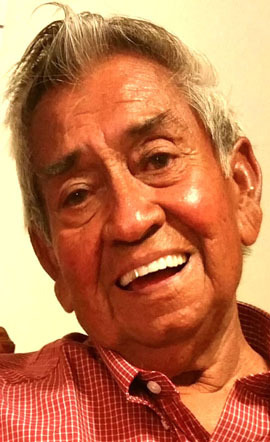 Hernandez, 85, passed away Sunday, Feb. 14, 2016, at his home. Fr. Martin Cornejo will officiate at the services, with interment to follow at Woodbine Cemetery. Pallbearers will be Ishmael Ray Chavarria, Andrew Chavarria, Aaron Vasquez, John Hernandez, Juan Perez, Manuel Esquibel Jr. and Pete Subia. Lupe was born April 21, 1930, in Spur, Texas, the son of Manuel and Manuela (Luna) Hernandez. He was a longtime Artesia resident. On July 16, 1955, he married Eloisa Anaya. Lupe was a truck driver for Rose Gravel and a member of Our Lady of Grace Catholic Church and Cursillistas. He helped with the veterans and offered help with transportation for anyone who needed it. Survivors include sons Lupe Hernandez Jr. of Artesia, Ted Hernandez of Rio Rancho and Chris Armenta of Carlsbad; daughters Aurora Lola Chavarria and Marcella Hernandez, both of Artesia, and Ernestine Yslas of Carlsbad; brother Tommy Manuel Hernandez of Artesia; sister Socorro Lulie Hernandez of Artesia; 14 grandchildren, Ishmael Ray Chavarria, Andrew Chavarria, Ranae Vasquez, Candyce Vasquez, Aaron Vasquez, John Hernandez, Monica Hernandez, Amy Yslas, Jessica Yslas, Peggy A. Rodriguez, Domenica Armenta, Anthony Dominguez, Julie Williams and Ashley Jackson; and 20 great-grandchildren. He was preceded in death by his wife, Eloisa Hernandez, on Sept. 2, 1973; his parents; grandson Isaiah Hernandez; and numerous brothers and sisters.